Rinse potatoes and put them in cold salted water. Boil the water and simmer potatoes until cooked through, about 45 minutes. Boil a pot of salted water; add cleaned and rinsed green beans. Longer beans can be cut in half. Simmer until soft, about 10 minutes. Chop the parsley. Peel and cut the potatoes into 2-inch slices. Drain the beans. 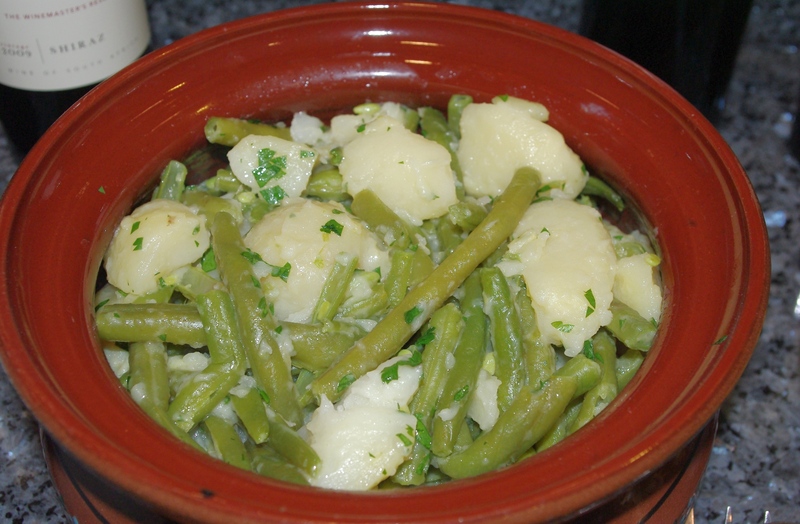 In a large pot, soften the butter then add the potatoes and beans and mix gently with a wooden spoon. Add parsley and salt to taste, if needed. Stir again or cover the pan and shake it a bit to spread the ingredients evenly. NOTE: Pancetta may be used instead of butter.